I love dumplings, more specifically Chinese style dumplings and dim sum. I love them steamed, panfried as potstickers, as soup dumplings, you name it I want to eat it. Well to my dismay, Korea doesn’t offer the array of tasty dumplings that you would think. I mean I’m used to at least a decent selection in the US, Taiwan or China. 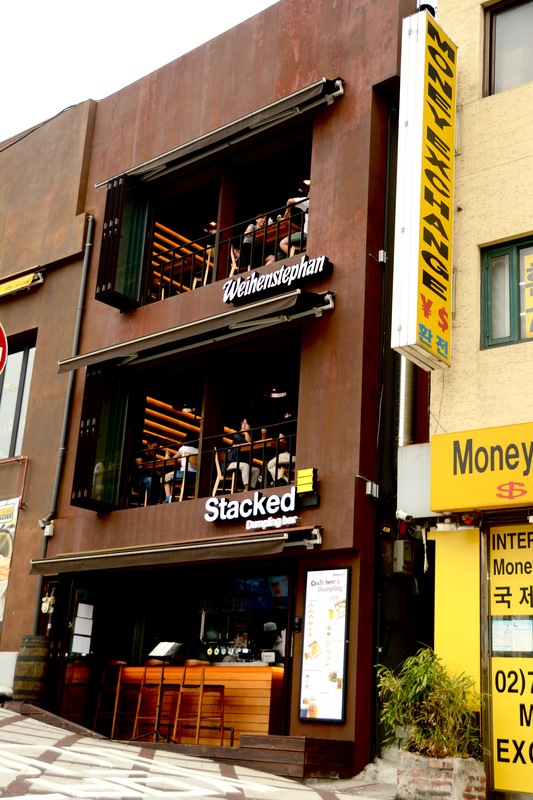 So I was intrigued (and hopeful) when I saw “Stacked Dumpling Bar” open up near the entrance to Itaewon. The dumplings in their signage looked good, but what did they taste like? Trust me I’ve been fooled before, but I was ready to find out! The storefront is quite small, but is 3 stories high, so I guess you could say that the restaurant itself is “stacked,” hahaaaa…. The menu can be found online here, however, it looks like the actual menu has been simplified and many offerings like the Har Gow or Shrimp Dumplings are no longer available, which is a disappointment. In addition to the dumplings, they have quite a few different craft beers on draft (ranging from 5,500 to 8000 won). When your food arrives you are given some pickled cucumbers (because you can’t eat in Korea without pickles!) and cabbage, a soy/vinegar blend and thinly sliced ginger. First out was the steamed XO Shrimp Dumplings (5 pcs for 8,000 won). I really didn’t think the filling tasted great, and would rate these dumplings “just okay”. I would’t order them again. Next up was one of my all time favorites, Xiao Long Bao…..aka Soup Dumplings (5 pcs for 4,800 won). Definitely a better value than the XO Shrimp Dumplings in my opinion. They had a decent amount of filling and soup in the dumplings, and the wrapper was a good chewy consistency (didn’t pop too easily). I would order these again. Next up is a classic and favorite of many, Siu Mai (5 pcs for 8,000 won). These were the table favorite as the dumplings were full of meat and then were topped off with a shrimp. The only thing I don’t like about them is the hefty price for 5! A last minute addition to our order was the Cheese Shrimp Ball (5 pc for 8,000 won). I wasn’t really sure what to expect, but I love shrimp balls when I order traditional dim sum and figured it was worth a try. The dish actually came out piping hot and the balls were nice and crispy on the outside and juicy inside. I didn’t get much cheese to be honest, but I wouldn’t say that was a bad thing. I really liked these and the sweet chili sauce for dipping was a good addition. 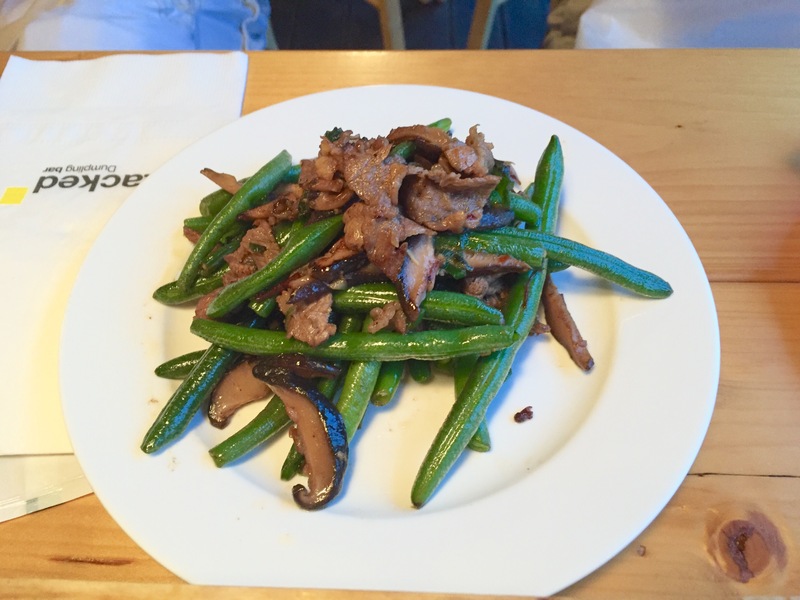 Last and actually least, was the Sauteed Green Beans and Beef in Oyster Sauce (8,000 won). Stir fried green beans are one of my all time favorite dishes. Super simple, but super delicious. This dish didn’t even come close, the string beans I suspect were just boiled, or maybe just quickly stir fried, they weren’t fully cooked and actually a little tough. The beef and mushrooms were slightly bland and I didn’t really taste the oyster sauce. Just skip this one all together and stick with the dumplings. The restaurant also offers some more out of the norm “dumplings” like samosas and empanadas. I may try them next time I visit, but this time was all about the classics. Overall if you’re in the need for a quick fix when you’re having a dumpling craving in the Itaewon area, you can try Stacked. However, if just regular steamed dumplings and potstickers will suffice, you’ll save yourself a lot of money by heading to Johnny’s Dumpling down the street instead.